Launched in 1189, the Third Crusade was called because of the Muslim recapture of Jerusalem in 1187 and the defeat of Palestinian knights at Hattin. It was ultimately unsuccessful. Frederick I Barbarossa of Germany drowned before he even reached the Holy Land and Philip II Augustus of France returned home after a short period of time. Only Richard the Lion Heart of England stayed long. He helped capture Acre and some smaller ports, only leaving after he concluded a peace treaty with Saladin. In 1186, Reynald of Chantillon breaks a truce with Saladin by attacking a Muslim caravan and taking several prisoners, including a sister of Saladin. This infuriates the Muslim leader who vows to kill Reynald with his own hands. March 3, 1186: The city of Mosul, Iraq, submits to Saladin. August 1186: Baldwin V, young king of Jerusalem. dies of an illness. His mother, Sibylla, sister of King Baldwin IV, is crowned Queen of Jerusalem by Joscelin of Courtenay and her husband, Guy of Lusignan, is crowned King. This is contrary to the previous king's will. The forces of Raymond of Tripoli are based in Nablus and Raymond himself is in Tiberias; as a consequence, the entire kingdom is effectively split in two and chaos reigns. The Third Crusade is led by Frederick I Barbarossa, Richard I Lion Heart of England, and Philip II Augustus of France. It would end with a peace treaty giving Christians access to Jerusalem and the Holy Places. March 1187: In response to his sister being taken prisoner and a caravan being captured by Reynald of Chantillon, Saladin begins his call for a holy war against the Latin Kingdom of Jerusalem. May 1, 1187: A large reconnaissance force of Muslims cross the Jordan river with the intent of provoking the Christians into attacking and thus allowing a larger war to commence. The incursion is designed to last just a single day and, near the end, several dozens Templars and Hospitallers charged the much larger Muslim force. Nearly all of the Christians died. June 26, 1187: Saladin launches his invasion of the Latin Kingdom of Jerusalem by crossing into Palestine. July 1, 1187: Saladin crosses the Jordan River with a large army intent on defeating the Latin Kingdom of Jerusalem. He is observed by Hospitallers in the fortress of Belvoir but their numbers are too small to do anything but watch. July 2, 1187: Muslim forces under Saladin capture the city of Tiberias but the garrison, led by Count Raymond's wife Eschiva, manage to hold out in the citadel. Christian forces camp at Sephoria in order to decide what to do. They don't have the strength to attack, but they are inspired to move forward by the image of Eschiva holding out. Guy of Lusignan is inclined to remain where he is and Raymond supports him, despite the likely fate of his wife if she is captured. Guy, however, is still plagued by the belief of others that he is a coward and late that night Gerard, Grand Master of the Knights Templar, convinces him to attack. This would be a serious mistake. July 3, 1187: Crusaders march from Sephoria in order to engage Saladin's forces. They brought no water with them, expecting to replenish their supplies at Hattin. That night they would camp on a hill with a well, only to discover that it was already dried up. Saladin would also set fire to the brush; the drifting smoke made the tired and thirsty Crusaders even more miserable. July 4, 1187, Battle of Hattin: Saladin defeats the Crusaders in an area northwest of Lake Tiberias and assumes control of most of the Latin Kingdom of Jerusalem. The Crusaders should never have left Sephoria - they were defeated as much by the hot desert and lack of water as they were by Saladin's army. Raymond of Tripoli dies of his wounds after the battle. Reynald of Chantillon, Prince of Antioch, is personally beheaded by Saladin but the other Crusader leaders are treated better. Gerard de Ridefort, the Grand Master of the Knights Templar, and the Grand Master of the Knights Hospitaller are ransomed. After the battle Saladin moves north and captures the cities of Acre, Beirut, and Sidon with little effort. July 8, 1187: Saladin and his forces arrive at Acre. The city capitulates to him immediately, having heard of his victory at Hattin. Other cities which also surrender to Saladin are treated well. One city which resists,Jaffa, is taken by force and the entire population sold into slavery. July 14, 1187: Conrad of Montferrat arrives at Tyre to take up the Crusading banner. Conrad had intended to land at Acre, but finding it under Saladin's control already he moves on to Tyre where he takes over from another Christian leader who is far more timid. Saladin had captured Conrad's father, William, at Hattin and offers a trade, but Conrad prefers to shoot at his own father rather than surrender. Tyre is the only Crusader Kingdom that Saladin is unable to defeat and it would last for another hundred years. July 29, 1187: The city of Sidon surrenders to Saladin. August 09, 1187: The city of Beirut is captured by Saladin. Aug. 10, 1187: The city of Ascalon surrenders to Saladin and Muslim forces re-establish control over the region. By the following month Saladin would also control the cities of Nablus, Jaffa, Toron, Sidon, Gaza ,and Ramla, completing a ring around the prize, Jerusalem. Sept. 19, 1187: Saladin breaks camp at Ascalon and moves his army towards Jerusalem. Sept. 20, 1187: Saladin and his forces arrive outside of Jerusalem and prepare to assault the city. Defense of Jerusalem is led by Balian of Ibelin. Balian had escaped capture at Hattin and Saladin personally gave permission for him to enter Jerusalem in order to retrieve his wife and children. Once there, however, the people beg him to stay and take up their defense - a defense that consists of three knights, if one includes Balain himself. Everyone else had been lost in the disaster at Hattin. Balian not only gains Saladin's permission to stay, but Saladin also ensures that his wife and children are given safe conduct out of the city and taken to safety in Tyre. Actions like this help ensure Saladin's reputation in Europe as an honorable and chivalrous leader. Sept. 26, 1187: After five days of scouting the city and the immediate surrounding area, Saladin launches his assault to retake Jerusalem from the Christian occupiers. Every male Christian had been given a weapon, whether they knew how to fight or not. The Christian citizens of Jerusalem would rely on a miracle to save them. Sept. 28, 1187: After two days of heavy battering, the walls of Jerusalem begin to buckle under the Muslim assault. St. Stephen's tower falls partially and a breach begins to appear at St. Stephen's Gate, the same place where the Crusaders had broken through nearly a hundred years earlier. Sept. 30, 1187: Jerusalem is officially surrendered to Saladin, commander of the Muslim forces besieging the city. In order to save face Saladin demands that a heavy ransom be paid for the release of any Latin Christians; those who cannot be ransomed are kept in slavery. Orthodox and Jacobite Christians are permitted to remain in the city. To show mercy Saladin finds many excuses to let Christians go for little or no ransom at all - even buying the freedom of many himself. Many Christian leaders, on the other hand, smuggle gold and treasure out of Jerusalem rather than use to free others from slavery. These greedy leaders include Patriarch Heraclius as well as many Templars and Hospitallers. Oct. 2, 1187: Muslim forces under the command of Saladin officially takes control Jerusalem from the Crusaders, effectively ending any major Christian presence in the Levant (also known as Outremer: the general region of the Crusader states through Syria, Palestine, and Jordan). Saladin had delayed his entry into the city by two days so that it would fall on the anniversary of when Muslims believe that Muhammed ascended from Jerusalem (the Dome of the Rock, specifically) to heaven to be in the presence of Allah. Unlike the Christian capture of Jerusalem almost a hundred years earlier, there is no mass slaughter - merely debates about whether Christian shrines like the Church of the Holy Sepulcher should be destroyed to take away Christian pilgrims' reason for returning to Jerusalem. In the end, Saladin insists that no shrines are to be touched and the holy sites of Christians should be respected. This stands in sharp contrast to Reynald of Chantillon's failed attempt to march on Mecca and Medina for the purpose of destroying them in 1183. Saladin also has the walls of Jerusalem destroyed so that, if the Christians ever take it again, they would not be able to hold it. Oct. 29, 1187: In response to the recapture of Jerusalem by Saladin, Pope Gregory VIII issues the Bull Audita Tremendi calling for the Third Crusade. The Third Crusade would be led by Frederick I Barbarossa of Germany, Philip II Augustus of France, and Richard I the Lionheart of England. In addition to the obvious religious purpose, Gregory has strong political motives as well: the squabbling between France and England, among others, was sapping the strength of the European kingdoms and he believes that if they could unite in a common cause, it would divert their warring energies and reduce the threat that European society would be undermined. In this he is briefly successful, but the two kings are able to set aside their differences for only a few months. Oct. 30, 1187: Saladin leads his Muslim army out of Jerusalem. November 1187: Saladin launches a second assault on Tyre, but this one fails as well. Not only had Tyre's defenses been improved, but it was now filled with refugees and soldiers had been allowed to go free from other cities Saladin captured in the region. This meant that it was filled with eager warriors. December 1187: Richard the Lionheart of England becomes the first European ruler to take up the cross and agree to participate in the Third Crusade. Dec. 30, 1187: Conrad of Montferrat, commander of the Christian defenses of Tyre, launches a night raid against several Muslim ships participating in the siege of the city. He is able to capture them and chase away several more, effectively eliminating Saladin's naval forces for the time being. Jan. 21, 1188: Henry II Plantagenet of England and Philip II of France meet in France to listen to Archbishop of Tyre Josias describe the loss of Jerusalem and most of the Crusader positions in the Holy Land. They agree to take up the cross and participate in a military expedition against Saladin. They also decide to impose a special tithe, known as the "Saladin Tithe," to help fund the Third Crusade. This tax amounts to one tenth of a person's income over a three year period; only those who participated on the Crusade were exempt - a great recruiting tool. May 30, 1188: Saladin lays siege the fortress of Krak des Chevaliers (headquarters of the Knights Hospitaller in Syria and the largest of all the Crusader fortresses even before most had been captured by Saladin) but fails to take it. July 1188: Saladin agrees to release Guy of Lusignan, king of Jerusalem. who had been captured at the Battle of Hattin a year before. Guy is under oath not to take up arms against Saladin again, but he manages to find a priest who declares the oath to an infidel invalid. The Marquis William of Montferrat is released at the same time. August 1188: Henry II Plantagenet of England and Philip II of France meet again in France and nearly come to blows over their various political disagreements. Dec. 6, 1188: The fortress of Safed surrenders to Saladin. Last known Norse visit to North America occurs. Jan. 21, 1189: Troops for the third crusade, called in response to the victories of Muslims under the command of Saladin, began to gather under King Philip II Augustus of France, King Henry II of England (shortly followed by his son, King Richard I), and Holy Roman Emperor Frederick I. Frederick drowned the next year on the way to Palestine - German folklore developed that asserted he was hidden in a mountain waiting to return and lead Germany to a new and brighter future. March 1189: Saladin returns to Damascus. April 1189: Fifty-two warships from Pisa arrive at Tyre to aid in the city's defense. May 11, 1189: German ruler Frederick I Barbarossa sets off on the Third Crusade. The march through Byzantine land has to be made quickly because Emperor Isaac II Angelus has signed a treaty with Saladin against the Crusaders. May 18, 1189: Frederick I Barbarossa captures the Seljuk city of Iconium (Konya, Turkey, located in central Anatolia). July 6, 1189: King Henry II Plantagenet dies and is succeeded by his son, Richard Lionheart. Richard would only spend a small amount of time in England, leaving the administration of his kingdom to various appointed officials. He was not very concerned about England and didn't even learn much English. He was much more concerned with protecting his possessions in France and making a name for himself that would last through the ages. July 15, 1189: Jabala Castle surrenders to Saladin. Aug. 26, 1189: Baghras Castle is captured by Saladin. Aug. 28, 1189: Guy of Lusignan arrives at the gates Acre with a force far smaller than that in the city's Muslim garrison, but he is determined to have a city to call his own because Conrad of Montferrat refuses to turn control of Tyre over to him. Conrad is supported by the Balians and the Garniers, two of the most powerful families in Palestine, and lays claim to the crown Guy wears. Conrad's house of Montferrat is related to the Hohenstaufen and an ally of the Capetians, further complicating the political relationships among the leaders of the Crusade. Aug. 31, 1189: Guy of Lusignan launches an assault against the well-defended city of Acre and fails to take it, but his efforts attract most of those streaming into Palestine to participate in the Third Crusade. Sept. 1189: Danish and Frisian war ships arrive at Acre to participate in the siege by blockading the city by sea. Sept. 3, 1189: Richard the Lionheart is crowned king of England in a ceremony at Westminster. When Jews arrive with gifts, they are attacked, stripped naked, and whipped by a mob which then moves on to burn down houses in the Jewish quarter of London. Not until Christian houses catch fire do authorities move in to restore order. In the following months Crusaders slaughter hundreds of Jews throughout England. Sept. 15, 1189 Alarmed by the growing threat of the Crusaders camped outside of Acre, Saladin launches an attack on the Crusader camp which fails. Oct. 4, 1189 Joined by Conrad of Montferrat, Guy of Lusignan launches an attack on the Muslim camp defending Acre which nearly succeeds in routing Saladin's forces - but only at the expense of heavy casualties among the Christians. Among those captured and killed is Gerard de Ridefort, Master of the Knights Templar who had previously been capture and then ransomed off after the Battle of Hattin. Conrad himself was nearly captured as well, but he was rescued by his enemy Guy. Dec. 26, 1189: An Egyptian fleet reaches the besieged city of Acre but it unable to lift the sea blockade. Queen Sibylla of Jerusalem dies and Guy of Lusignan claims sole rule of the Kingdom of Jerusalem. Both of their daughters had already died of disease a few days before, which means that Sibylla's sister Isabella was technically the successor in the eyes of many. Conrad in Tyreal so claims the throne, however, and confusion over who rules divides the Crusader forces. The Teutonic Knights are established by Germans in Palestine who also create a hospital near Acre. March 07, 1190: Crusaders slaughter Jews in Stamford, England. March 16, 1190: Jews in York England committed mass suicide in order to avoid having to submit to baptism. March 16, 1190: Jews in York are massacred by Crusaders preparing to set off for the Holy Land. Many killed themselves rather than fall into the hands of the Christians. March 18, 1190: Crusaders on a rampage kill 57 Jews in Bury St. Edmonds, England. April 20, 1190: Philip II Augustus of France arrives at Acre to participate in the Third Crusade. June 10, 1190: Wearing heavy armor, Frederick Barbarossa drowns in the Saleph River in Cilcia, after which the German forces of the Third Crusade fall apart and are devastated by Muslim attacks. This was especially unfortunate because unlike armies in the First and Second Crusade, the German army had managed to cross the plains of Anatolia without serious loss and Saladin was very concerned about what Frederick might accomplish. Eventually, a mere 5,000 of the original 100,000 German soldiers make it to Acre. Had Frederick lived, the entire course of the Third Crusade would have been altered - it likely would have been a success and Saladin would not have become such a revered hero in Muslim tradition. June 24, 1190: Philip II of France and Richard the Lionheart of England break camp at Vezelay and head off for the Holy Land, officially launching the Third Crusade. Together their armies are estimated to total over 100,000 men. Oct. 4, 1190: After a number of his soldiers are killed in anti-English rioting, Richard I Lionheart leads a small force to capture Messina, Sicily. The Crusaders under Richard and Philip II of France would be staying in Sicily for the winter. Nov. 24, 1190: Conrad of Montferrat marries a reluctant Isabella, sister Sibylla, deceased wife of Guy of Lusignan. With this marriage questions about Guy's claim to the throne of Jerusalem (which he only held because of his original marriage to Sibylla) were made more urgent. Eventually the two are able to resolve their differences when Conrad recognizes Guy's claim to the crown of Jerusalem in exchange for Guy turning control of Sidon, Beirut, and Tyre over to Conrad. Feb. 5, 1191: In order to quell a long-simmering feud, Richard Lionheart and Tancred, king of Sicily, meet together at Catania. March 1191: A ship loaded with corn arrives for the Crusader forces outside of Acre, giving the Crusaders hope and allowing the siege to continue. March 30, 1191: King Philip of France leaves Sicily and sets sail for the Holy Land to begin his military campaign against Saladin. April 10, 1191: King Richard Lionheart of England departs from Sicily with a fleet of over 200 ships, setting sail for what is left of the Latin Kingdom of Jerusalem. His journey is not nearly so calm and quick as that of his colleague, Philip of France. April 20, 1191: Philip II Augustus of France arrives to aid the Crusaders besieging Acre. Philip spends much of his time building siege engines and harassing the defenders on the walls. May 6, 1191: Richard the Lionheart's Crusader fleet arrives in the port of Lemesos (now Limassol) in Cyprus where he begins his conquest of the island. Richard had been travelling from Sicily to Palestine but fierce storm scattered his fleet. Most of the ships collected at Rhodes but a couple, including those carrying the bulk of his treasure and Ferengaria of Navarre, the future Queen of England, were blown to Cyprus. Here Isaac Comnenus treated them shabbily - he refused to allow them to come ashore for water and the crew of one ship that wrecked was imprisoned. Richard demanded the release of all prisoners and all stolen treasure, but Isaac refused - to his later regret. May 12, 1191: Richard I of England marries Berengaria of Navarre, first-born daughter of King Sancho VI of Navarre. June 1, 1191: The Count of Flanders is killed during the siege of Acre. Flemish soldiers and nobles had played important roles in the Third Crusade since the first reports of the fall of Jerusalem had been heard in Europe and the Count had been one of the first to take up the Cross and agree to participate in the Crusade. June 5, 1191: Richard I the Lionheart departs Famagusta, Cyprus, and sets sail for the Holy Land. June 6, 1191: Richard Lionheart, king of England, arrives at Tyre but Conrad of Montferrat refuses to allow Richard to enter the city. Richard had sided with Conrad's enemy, Guy of Lusignan, and so is made to camp on the beaches. 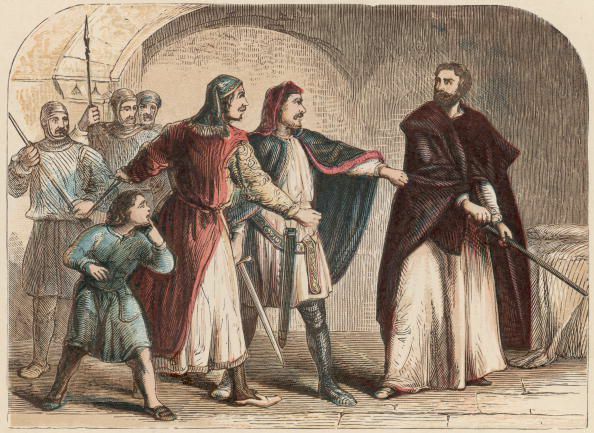 June 7, 1191: Disgusted with his treatment at the hands of Conrad of Montferrat, Richard Lionheart leaves Tyre and heads for Acre where the rest of the Crusading forces are besieging the city. June 8, 1191: Richard I the Lionheart of England arrives with 25 galleys to aid the Crusaders besieging Acre. Richard's tactical skills and military training make a huge difference, allowing Richard to take command of the Crusader forces. July 2, 1191: A large fleet of English ships arrives at Acre with reinforcements for the siege of the city. July 4, 1191: The Muslim defenders of Acre offer to surrender to the Crusaders, but their offer is rebuffed. July 12, 1191: Acre surrenders to Richard I the Lionheart of England and Philip II Augustus of France. During the siege 6 archbishops, 12 bishops, 40 earls, 500 barons, and 300,000 soldiers are reported killed. Acre would remain in Christian hands until 1291. Aug. 1191: Richard I the Lionheart takes the large Crusader army and marches down the coast of Palestine. Aug. 26, 1191: Richard I the Lionheart marches 2,700 Muslim soldiers out of Acre, onto the road of Nazareth in front of the forward positions of the Muslim army, and has them executed one by one. Saladin had for more than a month delayed on fulfilling his side of the agreement that had led to the surrender of Acre and Richard means this as a warning of what would happen if the delays continue. Sept. 7, 1191, Battle of Arsuf: Richard I the Lion Heart and Hugh, Duke of Burgundy, are ambushed by Saladin in Arsuf, a small town near Jaffaabout 50 miles from Jerusalem. Richard had prepared for this and the Muslim forces are defeated. Muslims conquer Dehli and later all of Northern and Eastern India, establishing a Dehli sultanate. Hindus would suffer many periods of persecution at the hands of Muslim rulers. Jan. 20, 1192: After deciding that a siege of Jerusalem during the winter weather would be unwise, Richard the Lionheart's Crusading forces move into the ruined city of Ascalon, demolished by Saladin the previous year in order to deny it to the Crusaders. April 1192: The population of Cyprus revolts against their rulers, the Knights Templar. Richard the Lionheart had sold Cyprus to them, but they were cruel overlords known for their high taxation. April 20, 1192: Conrad of Monteferrat learns that king Richard now supported his claim on the throne of Jerusalem. Richard had previously supported Guy of Lusignan, but when he learned that none of the local barons supported Guy in any way, he chose not to oppose them. In order to prevent a civil war from breaking out, Richard would later sell the island of Cyprus to Guy, whose descendants would continue to rule it for another two centuries. April 28, 1192: Conrad of Montferrat is murdered by two members of the sect of the Assassins who had, for the previous two months, posed as monks in order to gain his trust. The Assassins had not sided with Saladinagainst the Crusaders - instead, they were paying Conrad back for his capture of a shipload of Assassin treasure the year before. Because Conrad was dead and his rival Guy of Lusignan had already been deposed, the throne of the Latin Kingdom of Jerusalem was now vacant. May 5, 1192: Isabella, Queen of Jerusalem and wife of the now deceased Conrad of Montferrat (killed by assassins the month before), marries Henry of Champagne. A quick marriage was urged by the local barons so as to ensure political and social stability among the Christian Crusaders. June 1192: Crusaders under the command of Richard the Lion Heart march on Jerusalem. but they are turned back. The Crusader efforts were seriously hampered by Saladin's scorched-earth tactics which denied the Crusaders food and water during their campaign. Sept. 2, 1192: The Treaty of Jaffa puts an end to hostilities of the Third Crusade. Negotiated between Richard I the Lion Heart and Saladin, Christian pilgrims are granted special rights of travel around Palestine and inJerusalem. Richard had also managed to capture the cities of Daron,Jaffa, Acre, and Ascalon - an improvement over the situation when Richard first arrived, but not much of one. Although the Kingdom ofJerusalem was never large or secure, it was now still very weak and did not reach inland more than 10 miles at any point. Oct. 9, 1192: Richard I the Lion Heart, ruler of England, departs the Holy Land for home. On the way back he is taken hostage by Leopold of Austria and he doesn't see England again until 1194. March 3, 1193: Saladin dies and his sons begin to fight over who will take control of the Ayyubid Empire which consists of Egypt, Palestine, Syria, and some of Iraq. Saladin's death is probably what saves the Latin Kingdom of Jerusalem from being quickly defeated and allows Christian rulers to remain a while longer. May 1193: Henry, king of Jerusalem. discovers that Pisan leaders had been conspiring with Guy of Cyprus to take over the city of Tyre. Henry arrests those responsible, but Pisan ships begin raiding the coast in retaliation, forcing Henry to get expel the Pisan merchants altogether. The last Seljuk Sultan, Toghril bin Arslan, is killed in battle against the Khwarazm-Shah Tekish. Feb. 20, 1194: Tancred, king of Sicily, dies. Death of Guy of Cyprus, originally Guy of Lusignan and once king of the Latin Kingdom of Jerusalem. Amalric of Lusignan, Guy's brother, is named his successor. Henry, king of Jerusalem. is able to make a treaty with Amalric. Three of Amalric's sons are married to three daughters of Isabella, two of which were also Henry's daughters. Alexius III deposes his brother Emperor Isaac II Angelus of Byzantium, blinding him and putting him in prison. Under Alexius the Byzantine Empire begins to fall apart. Berthold, Bishop of Buxtehude (Uexküll), launches the first armed conflict of the Baltic Crusades when he sets a Crusading army against local pagans in Livonia (modern Latvia and Estonia). Many are forcibly converted during the following years. German Crusaders under the command of Emperor Henry VI launch attacks throughout Palestine, but fail to achieve any significant goals. Henry is the son of Frederick Barbarossa, a leader of the Second Crusade who tragically drowned on the way to Palestine before his forces could accomplish anything and Henry had been determined to finish what his father had started. Henry of Champagne, king of Jerusalem. dies in Acre when he accidentally falls from a balcony. This was the second husband of Isabella's to die. The situation is urgent because the Crusader city ofJaffa is being threatened by Muslim forces under the command of Al-Adil, Saladin's brother. Amalric I of Cyprus is chosen as Henry's successor. After marrying Isabella, the daughter of Amalric I of Jerusalem. he becomes Amalric II, king of Jerusalem and Cyprus. Jaffa would be lost, but Amalric II is able to capture Beirut and Sidon.